Reviews of the Sony E PZ 16-50mm F3.5-5.6 OSS from around the web. The Sony 16-50mm Retractable Zoom Lens ($349.99 direct) is the smallest zoom lens you can get for a NEX camera, but its optical quality shows the compromises that are required to pull off its design. It covers a 24-75mm field of view in terms of full-frame photography, with the standard f/3.5-5.6 aperture range you expect in a entry-level zoom lens. The lens is the standard kit lens for the Sony Alpha NEX-6, and is slated to be available for sale on its own and bundled with the NEX-5R in early 2013—in both cases it adds $150 to the body-only price, representing a $200 savings versus buying the lens and camera separately. A common complaint with Sony's NEX camera system is the size lenses need to be due to the large APS-C sized imaging sensor. 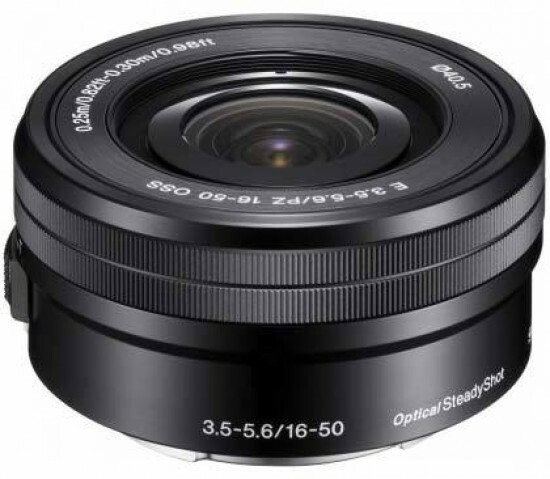 This new E16-50mm f/3.5-5.6 OSS lens may be the answer to that issue. It uses a collapsible design and a powered zoom mechanism and only protrudes from the body by 29.9mm when it is collapsed. On top of this, it also sports an optical stabilisation system and a field of view equivalent to a 24-75mm lens on a 35mm camera for quite a reasonable price of around £310.